Location: South side of Plex Moss Lane. Notes: Plex Moss Lane Halt was on the former Liverpool, Southport & Preston Junction Railway (LSPJR) Barton branch which opened on 2 September 1887. Since 15 July 1897 the line had been part of the Lancashire & Yorkshire Railway (LYR). Passenger services had operated on the line since 2 September 1887 but they had not been a success. 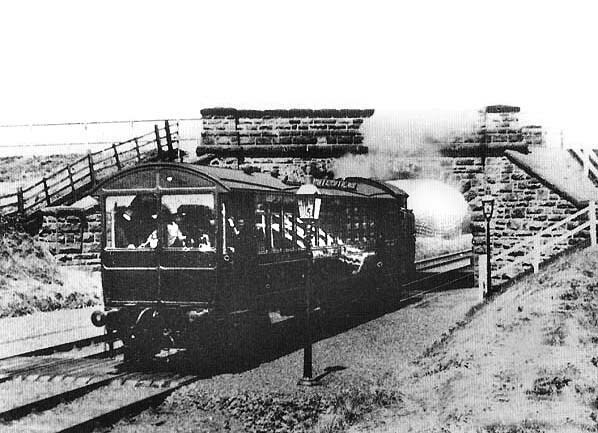 In July 1906 the LYR introduced a ‘railmotor’ service between Southport Chapel Street and Altcar & Hillhouse. To coincide with the introduction of the railmotor two halts were opened, one of which was Plex Moss Lane. 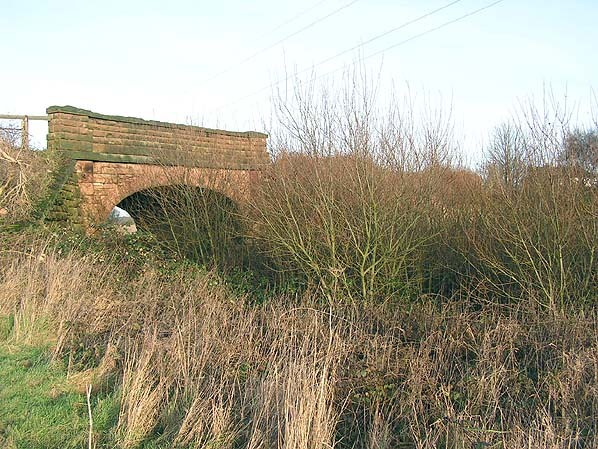 The halt was immediately south of Plex Moss Lane road overbridge and served a few scattered farms within easy walking distance. It consisted of a set of steps down to track level from the overbridge on the ‘up’ (Altcar & Hillhouse direction) side of the line. At track level on the double-track route there were two short, low platforms composed of gravel. At the southern end was a barrow crossing to provide access from the ‘up’ to the ‘down’ (Southport direction) platform. There were two lamps on the up platform, and no form of shelter was provided. The railmotor proved to be a success, and in March 1907 two more halts were opened. Plex Moss Lane Halt was served by ten trains in each direction although not all of the southbound services went as far as Altcar & Hillhouse, many terminating a short distance to the south at Barton. 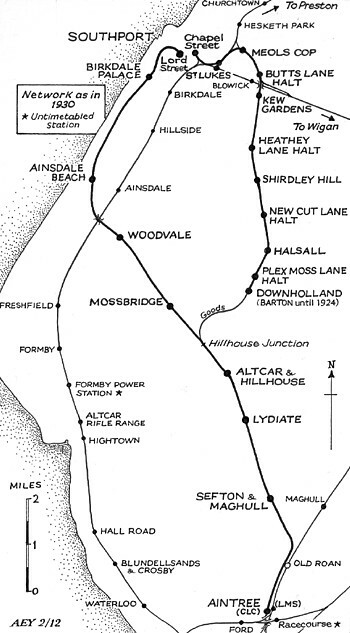 Altcar & Hillhouse did offer interchange possibilities with Cheshire Lines Committee (CLC) services running between Southport Lord Street and Liverpool or Manchester, but it seems unlikely that there would have been much demand for this. locally as ‘Altcar Bob’. There are a number of suggestions how the service acquired its name. The use of Altcar is obvious as it was the southern terminus, but the origin of ‘Bob’ is open to question. Some local people say that the original driver was called Bob, while others think that the name could be related to the ticket fare, ‘bob’ being the general term for a shilling. A more likely explanation is that it was named by railwaymen who, it is said, referred affectionately to small engines as ‘Bob’. On 1 January 1922 Plex Moss Lane Halt became part of the London & North Western Railway (LNWR) after they absorbed the LYR. The July 1922 timetable showed ten weekday departures from the halt for Southport Chapel Street, four for Altcar & Hillhouse, and six for Barton. The following year the LNWR was, in turn, merged with other companies to form the London Midland & Scottish Railway (LMS). In summer 1932 the LMS operated ten services from Plex Moss Halt to Southport Chapel Street and ten to Downholland. The first arrival at Plex Moss Halt was at 7:04am and first departure was at 7:12am. The last arrival was at 9:44pm and it left for a return journey to Southport at 9:52pm. Goods services continued to pass through the site of Plex Moss Lane Halt until 21 January 1952 after which the line south of Shirdley Hill was closed. It was lifted in the early 1960s, and by 2011 there was no trace of the halt. The road overbridge, however, remained in situ. Bradshaw from Chris Hind and route map drawn by Alan Young. Plex Moss Lane Halt in c1910 looking north. The railmotor service known as the 'Altcar Bob' is seen standing at the halt having just arrived on a service from Southport Chapel Street. The train would have then gone southwards to terminate at either Barton (later Downholland) or at Altcar & Hillhouse. 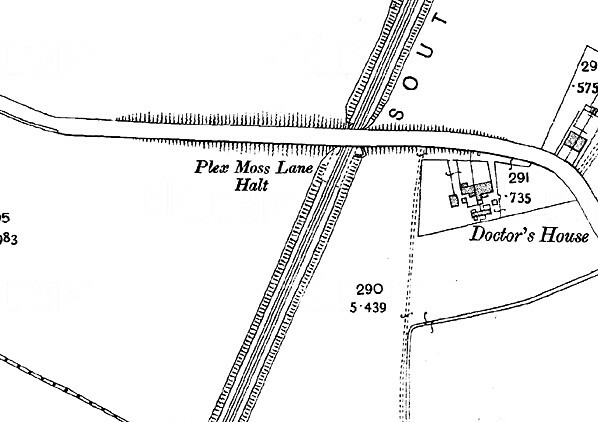 Plex Moss Lane Halt as shown on a 1908 map. 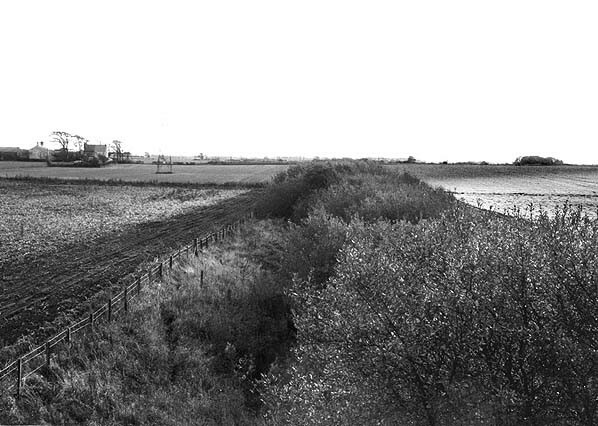 The site of Plex Moss Lane Halt looking south in October 1982. The site of Plex Moss Lane Halt looking north in January 2006.